DCIS – What is it? As we enter into the season of giving, this blog seems most fitting. My mother passed away unexpectedly 31 years ago. I was in college at the time and remember returning home for the funeral only to discover a partially packed box mom had been preparing to mail me for Halloween. The box contained a macrame skeleton and a hand stitched and stuffed orange pumpkin. I remember thinking at the time, and every time I touched these items, that these were my mom’s final gifts to me. But little did I know that over three decades later I would receive an unexpected gift. The macramé skeleton enjoyed years of decorating our front stoop or porch while the boys were growing up. The toll of inclement fall weather deteriorated the gift; a tumble off its hook on a blustery day caused the already brittle scapula (wooden rod) to break a few years ago. The skeleton received a simple burial in our waste can. It was difficult to throw the battered skeleton away, knowing that my mother’s hands had lovingly made it for me. A mom who found her way through pottery, painting, batik and other arts to express herself; a mom who regularly shared her gifts, material and personal, with others. Unexpectely, my final gift perspective changed last summer during a visit to see my dad and step mom, Ruta. My visits to Marietta had become more frequent the past two years, as Ruta’s health was declining due to her ALS, Lou Gerig’s disease. It was during my final visit while Ruta was alive that she asked my dad to bring me something. In a weak voice that I could barely understand, Ruta strained to say she had been meaning to make sure I got this for some time and apologized it took so long. Ruta said the she was uncertain, as was my dad, of whether this item was intended for me or whether my mom had purchased it for herself. Minutes later, my dad presented me with a spectaular hand carved round box. Upon opening the top of the box, I could see that a well preserved item was nestled inside; I unfolded the cotton and carefully unearthed the gift. The round box was obviously made by a master artist and was a gift in itself, but what was found inside made my heart pause. It was a ring that may never have been taken out of its encased nest. A gift waiting to be given for over three decades. Ruta reminded me that it was probably purchased during my mom and dad’s trip to China (my mother passed away shortly after that trip). 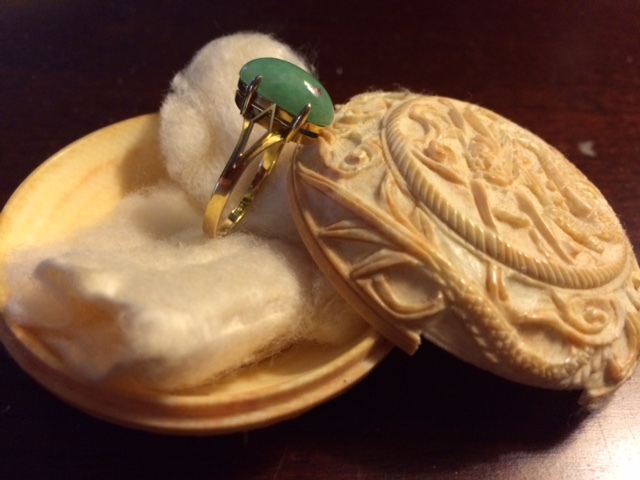 My dad didn’t have much memory of the ring or its’ intended finger, but Ruta felt strongly it was meant to be a gift to me since it was still wrapped so perfectly and may have been intended to be a Christmas gift in 1983. As I slipped the jade ring on my right ring finger, I admired the simple beauty of the stone and gold setting and then thought of my mother. Choking back the tears, I managed to whisper a “thank you” to Ruta, not knowing that this would also be the final gift she would give to me in person. It was only three months later that Ruta passed away from ALS. Now, each time I wear the ring, it reminds me of the wonderful gift of my mom the first 22 years of my life and also of Ruta, the mom I was lucky enough to have for nearly 30 more. I find that the ring gives me the strength of two accomplished women, which both comforts and empowers me. Although I cherish my hand sewn pumpkin, I now have a new “final gift” to remember my mother by and a special memory of how that gift was given to me by Ruta. We never know when we won’t have the time to present our loved ones with a final gift. Don’t wait to give yours to those you love. Simply saying “I love you” or giving a hug is a gift we can all afford to give. Who needs your gift today?